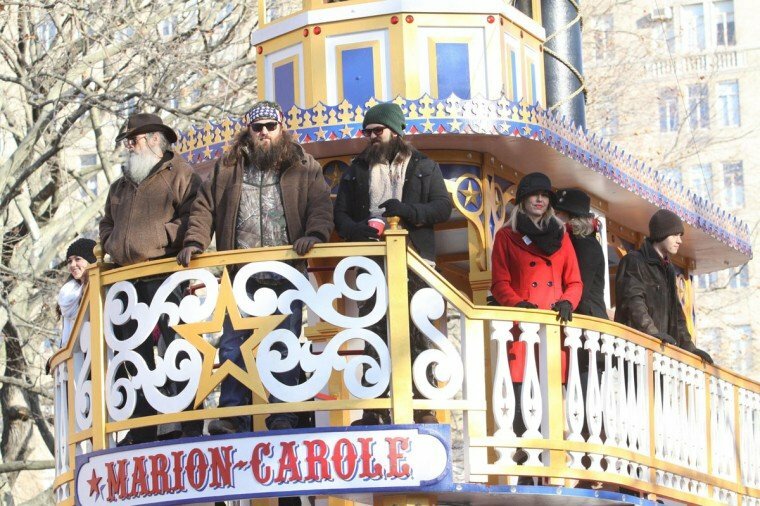 Duck Dynasty’s Si, Willie and Jase Robertson went to New York City on Thursday where they took part in the prestigious Macy’s Thanksgiving Day Parade. Uncle Si, Willie and Jase Robertson were sporting their favorite hats, bandannas and warm coats as they stand on their float. At times, the Duck Dynasty stars looked a little bemused as their boat-like float Marion Carole made its way along the route lined by a reported 3.5 million spectators. Jase Robertson, sporting his trademark beanie hat, sunglasses and sheepskin fleece, was joined by his wife Missy who looked a lot more seasonal in red coat and black hat. Duck Dynasty has just completed the fourth season with the premiere attracting a whopping 11.8 million, making it the most-watched nonfiction cable telecast in history.